This chronology is currently a 20-page report. I want to thank all the members of the A-Team who made this possible. Finally, but certainly not least, I want to thank Loren Gross for thoughtfully and diligently collecting data many years ago for his UFO Histories and supplemental notes, in particular here the year 1951. A big thanks to CUFOS and Mary Castnor for housing them on the CUFOS site at. Craft hit soldier with light beam. Look magazine article: Dr. Urner Liddel, Office of Naval Research, stated "There is not a single reliable report of an observation which is not attributable to the cosmic balloons (plastic "Skyhook" research balloons)." Recognition of Flying Saucers. 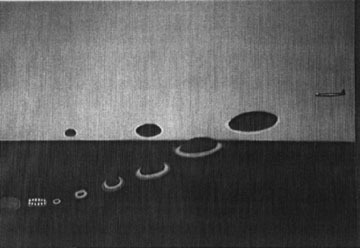 Document which states, "A flying machine in so featureless a form as a saucer would probably be one of the most difficult things to recognize as such, even in ideal observing conditions." 3:00 AM. The Incident #26 report describes the event in more detail. Lt. George Williams was piloting a Navy Fleet Logistics airplane cruising at 10,000 feet. At first he thought the object was a ship and then called the copilot forward. Nine witnesses saw the object approach at terrific closing rate. It veered to their port side and hovered momentarily, then rose at extremely rapid rate and disappeared off their port quarter. Size was estimated at 200 feet in diameter, flat elliptical or cigar shaped by side view and seemed to be producing a ring of red-orange exhaust all along the edge. (Jan Aldrich, Project Interloper report). Feb. 26, 1951; "Scientist Fears Flying Saucers Portend a 'Worse Pearl Harbor' "
11:30 PM. It was during the Korean War and a naval destroyer was on the alert for bombers coming in from the northeast, east and south­east. It was plotting all aircraft going north and south along the coast and in as far as the Appalachian Mountains. Source reporting said they tracked an object coming in from due east at a speed of 85 to 90 knots and an altitude of 3,000 to 4,000 feet. It got within about 30 miles of the destroyer and just stopped and hovered. Source informed the bridge, which informed the captain, and he instructed them to head out toward the object. About half an hour later, when the ship was within 15 miles of the object, the object suddenly took off on a northerly course very rapidly. Its speed was estimated at about 5,000 kms an hour. The object got to within 35 to 40 miles south of Nantucket Island and suddenly went straight up into the atmosphere. Altitude-determining radar tracked the object up to 100 miles above the earth and still going straight up. A report was made to the Pentagon.. It's interesting to compare the August 29, 1950 version of the script for "The Thing From Another World" with the dialog in the film as actually released on April 6, 1951. Sometime between August 1950 and the time the film was completed, a pretty interesting detail was added -- the concept of "radiation-triggered cameras" to track UFOs. (See report by Joel Carpenter). Morning. Pilot was flying a Loan L-4 that had taken off from Atlanta Municipal Airport. He climbed to 3000 feet on a 180° heading. The wind was from the west, 270° at 12-15 mph and there was some low ground fog and scud. Overhead, it was very clear, no overcast or cloud. Pilot was in the rear seat, as the aircraft was placarded for solo flights the pilot was to fly from the rear. He was about 20 minutes out of Atlanta when he saw a perfectly round disc slightly SW at about the two o’clock position. His first thoughts were that he had lost his heading and that he was looking at the sun through an overcast.. He glanced at his compass and he was steady on a 180° heading. He looked to the East and saw the sun well above the horizon. His next thought, was it a weather balloon? He ruled this out because it was not moving. He then headed in the direction of the disc which he noted was 210° and high. He tried to guess how far away the object was, but there wasn’t anything to compare or estimate the distance. He began to climb in the direction of the object, constantly observing it. The disc was a white silvery color and seemed to be oscillating but remaining perfectly stationary as far as vertical or horizontal motion was concerned. He continued towards the object and after 8-10 minutes of steady observation the L-4’s engine began to run rough and the instrument panel began to vibrate very badly. He looked at the compass and it appeared to be spinning wildly. He thought the engine was icing up and he tried to get the carburator heater on, but nothing happened, the vibration and roughness continued seemingly getting worse and he thought the engine was going to quit any second. His thoughts were of disappointment not to be able to continue towards the object but that possibly he could glide to some open field where he practiced emergency landings. He turned back N and headed for the airport and at the same time continued to look back over his left shoulder to watch the object, which was still in the same position. He was looking directly at the object, and as if someone pulled a switch the object completely disappeared, no vapor trail or anything, it was just gone. Immediately the vibration and roughness disappeared and the L-4 ran as smooth as ever. He landed at Atlanta. (NARCAP Case 12, Source : Capt. Robert H. Pasley written report sent to Major Donald Keyhoe, NICAP in March 1965). July 23, 1951 (wrong date in UFOE. See Sept 23rd); March Field, Calif.
Popular Science. Editors surveyed witnesses to choose most plausible explanations for UFOs; 70% believed they were intelligently controlled devices, either man-made or extraterrestrial. August 1951; Central, N. Mex. August 3, 1951; Nr. Pinckney, Mich.
August 11, 1951; Portland, Ore. Famous Lubbock Lights/Carl Hart photo case. This case may be questionable, but the next one isn't. I almost overlooked the report from the radar station (Larson, see next report) because it was fairly short. It said that early on the morning of August 26, only a few hours after the Lubbock sighting (Albuquerque), two different radars had shown a target traveling 900 miles per hour at 13,000 feet on a northwesterly heading. The target had been observed for six minutes and an F-86 jet interceptor had been scrambled but by the time the F-86 had climbed into the air the target was gone. The last paragraph in the report was rather curt and to the point. It was apparently in anticipation of the comments the report would draw. It said that the target was not caused by weather. The officer in charge of the radar station and several members of his crew had been operating radar for seven years and they could recognize a weather target. This target was real. I quickly took out a map of the United States and drew in a course line between Lubbock and the radar station. A UFO flying between these two points would be on a northwesterly heading and the times it was seen at the two places gave it a speed of roughly 900 miles per hour. This was by far the best combination of UFO reports I'd ever read and I'd read every one in the Air Force's files. Civilian Instructions For Reporting Vital Intelligence Sightings from Aircraft, another of the Intelligence regulations governing reporting in accordance with Joint Army-Navy-Air Force Publication 146 (JANAP 146). Several versions are known to have existed from 9-Sept-1951 to 13-May-1955. Presented here is a text copy of the 10 March 1954 version. At 7:30 a.m. to 7:32 a.m. local time (1230Z to 1232Z, 22 October 1951), radar operators detected an object on a course west and then to the south. The speed of the object was 2400 knots.The length of the observation was 2 minutes. A message from the 32nd Air Division stated, the individual echo returns and the appearance of the track substantiated the probability of these radar pickups being of a flying object rather that some kind of radar interference or malfunction. (Dan Wilson, McDonald files, Jan Aldrich, FUFOR Index). Capt. Edward J. Ruppelt, new chief of revised Project GRUDGE, the Air Force UFO investigation. Nov. 10, 1951; Albuquerque, N.M.
9:00 p.m. At dusk, Sam Coley's 12-year old son called his father and 17-year old sister out to see a strange object coming out of the sky. It was shaped like two saucers put together, with a cabin like bulge in the center. It was almost silent; a slight "purr" could be heard. It stopped about 6 ft above the ground, about 300 yards from the house. "It gave off no light except from windows in the cabin. Coley said he saw a man inside." After hovering for 10 minutes, it took off, almost silently, "like a bolt of lighting." The police chief apparently lost his skepticism after the interview. (Barry Greenwood, Albert Rosales).